This awesome and amazing piece of fan art came to me from eleven year old Patrick R. from Lawrence, Massachusetts, and I couldn’t resist publishing it. Chuck, Succotash, Oliver, Grace, J.R. and the whole Peanizles gang get their fair share of fan art to cross the desk, but rarely does the artist. Thanks for the amazing cartoon likeness and keep sending in the fan art gang! I recently had the opportunity to be part of a gallery exhibition of cartoonists, at the Essex Art Center, Lawrence, Massachusetts. The show was a truly amazing opportunity to be a part of a group of exceptionally talented cartoonists. Above left to right: Brian McFadden, Elena Steier, Norm Feuti, and Don Mathias. There was the brilliantly funny, and subversive, political comics of Brian McFadden, of Big Fat Whale and The New York Times, The Strip; Elena Steier and her cute yet gothic comic strips, The Goth Scouts, Queen Of The Cosmos, and the Tee Dogs; and Norm Feuti, and his fantastically funny take on working in the wide world of Retail, in Retail, and the charming, and good-hearted tales of Gil. The show which ran from January through February 2013, was a phenomenal success, and drew people and students all with the same unbridled passion and interest in comics, and the truly American art form of the comic strip. Please enjoy some of these pictures from the show, and head on over to each of the artist’s websites and enjoy all of the hard-work and passion that is part of each comic strip. Well, just as the Northeast here, in Boston, is digging itself out from the most recent winter blast that Mother Nature throws at us, I’ve put up some free Snow themed wallpaper for your computer! 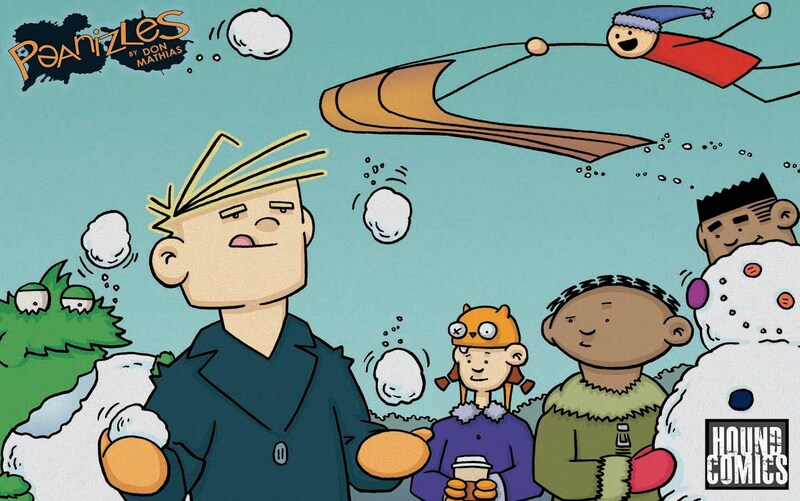 Get in on the wintery action with Chuck and the gang and see who can make the better snowman!